With U.S.-Canada relations at a low after G-7, the risks are rising that the U.S., Canada and Mexico will be unable to strike a deal to revamp the North American Free Trade Agreement. Analysts say the outcome is difficult to predict, with talks entering a natural time for a lull in the weeks ahead of the Mexican election July 1. "The atmospherics between the three countries are terrible right now," said Jonathan Lieber, principle in economics and statistics at PWC. "Even before this weekend, with the introduction of steel and aluminum tariffs on Canada and Mexico, I think that was a very bad sign for the future of the deal," he said. "They're still really apart on fundamental issues." Lieber said a deal this year is unlikely altogether because it would be difficult to get it before Congress in time. "I think they are at a stalled point. Publicly, they mention they are still working at a technical level, but the conversation is toned down, to say the least," said Juan Carlos Hartasanchez, Albright Stonebridge Group senior director. "I think what we've seen not only from the prime minister of Canada but the foreign minister would indicate Canada's much stronger position for negotiation," he said. "Mexico will need to resist the temptation to start negotiations bilaterally. That's what the U.S. would want. It would seem the path of least resistance to get an agreement, but they will lose a lot of negotiating power if they go at it independently without the support of Canada." President Donald Trump refused to sign a G-7 communique Saturday after he initially was going to do so. 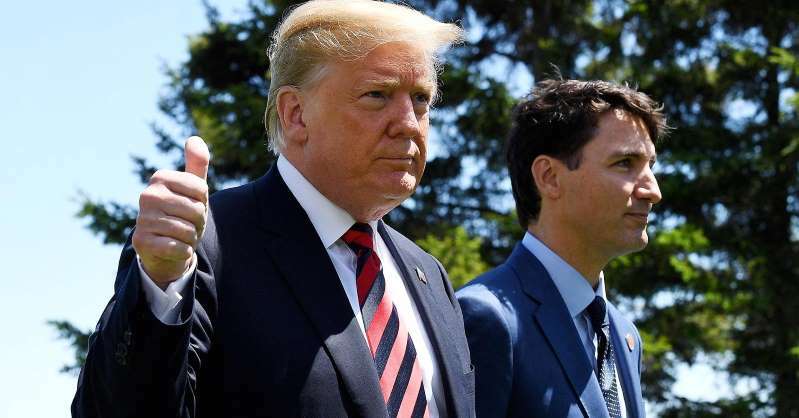 He said Canadian Prime Minister Justin Trudeau made false statements at a news conference, where Trudeau said Canada was going to take retaliatory action against U.S. tariffs. Top White House economic advisor Larry Kudlow said Sunday that Trump felt betrayed by Trudeau, saying the prime minister's comments were for domestic political consumption and he "stabbed us in the back." Alejo Czerwonko, emerging markets strategist at UBS Global Wealth Management's Chief Investment Office, said the weekend developments make it look like a NAFTA resolution could take even longer, creating an atmosphere of uncertainty for corporations that need to plan. "Ultimately we think the NAFTA standoff will be favorably resolved," he said. But there is political risk in Mexico, and it's part of what's being reflected in the peso, which has been declining. "Some investors might be adjusting to the idea that the Mexican Congress will wind up in the hands of Andrés Manuel Obrado's party and allied parties. The bottom line is that's probably something to do with a less favorable NAFTA outlook." Leftist candidate Andrés Manuel López Obrado is the frontrunner in the Mexican election, and he would take over the presidency in December. "Ultimately, we think the NAFTA standoff will be favorably resolved. It most likely will not be this year," said Czerwonko. Risks are also rising that Trump decides to drop out of NAFTA, which would trigger a six-month period before the U.S. could withdraw. "No Congressional approval required. Because this hasn't happened since 1866 (which is a bit of a ridiculous practical precedence given the changes in economies, etc. ), we do not know what would actually happen if this happened: tariffs reset to 1994? U.S. investment to Mexico blocked/unwound? It would be a zero-gravity environment. What is clear is that President Trump can go down this road with a single stroke of a pen and a six-month lag," Cowen analysts said, in a note. But Hartasanchez says Congress could challenge a withdrawal by the president and that could take months since it could end up facing a court challenge. There's a lot at stake if Trump does succeed in dropping out of the trade agreement, including the disruption of tightly woven supply chains. The auto industry would be hit hard by an end to NAFTA, and Cowen said other industries that would suffer include apparel and freight transport. Citigroup economist Dana Peterson said she still sees a 60 percent chance that NAFTA will be successfully renegotiated. "These trade agreements can be pretty nasty, but in the end they can get done. So I think the thing is what we're seeing in the news is there's still a willingness to talk. The Trump administration has been preoccupied by G-7 over the weekend, and the North Korea summit. NAFTA has been pushed into the background. That kind of good news," Peterson said. "We're also seeing in the news that Mexico is still willing to talk and there may be a convening of the negotiators in early July. That's good news. " Trade experts also say risk that the Trump administration could find a way to put tariffs on imported cars on national security grounds has become a bigger concern since Trump's G-7 appearance. "That would be a nuclear bomb," said Hartasanchez.